Proper lubrication of articular cartilage is essential to joint health. In arthritic joints or after traumatic injury, lubrication is impaired and can promote cartilage damage. Our lab studies cartilage lubrication mechanisms and therapies for treating osteoarthritis (OA). 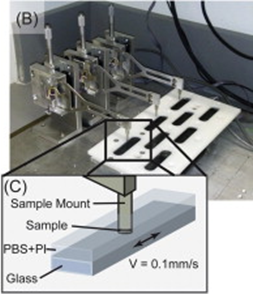 We have a custom-built tribometer, which we we use to measure friction coefficients of cartilage. Photograph and diagram of custom tribometer. Diagram of natural lubricin protein (A) and the biomimetic polymer (B), which share a hydrophilic brush structure. Taken from: Samaroo et. al. (2013). Characterization of binding and lubricating properties of biomimetic boundary lubricants for articular cartilage. Orthopaedic Research Society 2013 Annual Meeting. Paper No. 0392. See also: Samaroo et. al. (2016), Binding and lubrication of biomimetic boundary lubricants on articular cartilage. Journal of Orthopaedic Research.